Save the Date in 2016! Updated to reflect the new exhibition dates of April 1 & 2, 2016. Save the date! The First Annual Old Fort Lowell Artists Group exhibition is history but next event is already on the calendar! The participating artists met after the show to review the logistics and whether or not to continue. The unanimous vote – go forward with the 2nd OFLAG exhibition year after next. The dates have already been reserved at the San Pedro Chapel for April 1 and 2, 2016. All agreed this year’s inaugural event was a resounding success! Credit for that goes to the friends, family, neighborhood residents and art patrons who showed their support by crowding the Chapel during Friday night’s reception. The event had a lively vibe as artists and patrons had a chance to intermingle. In just 2 1/2 hours more than $6,000 in sales were racked up. 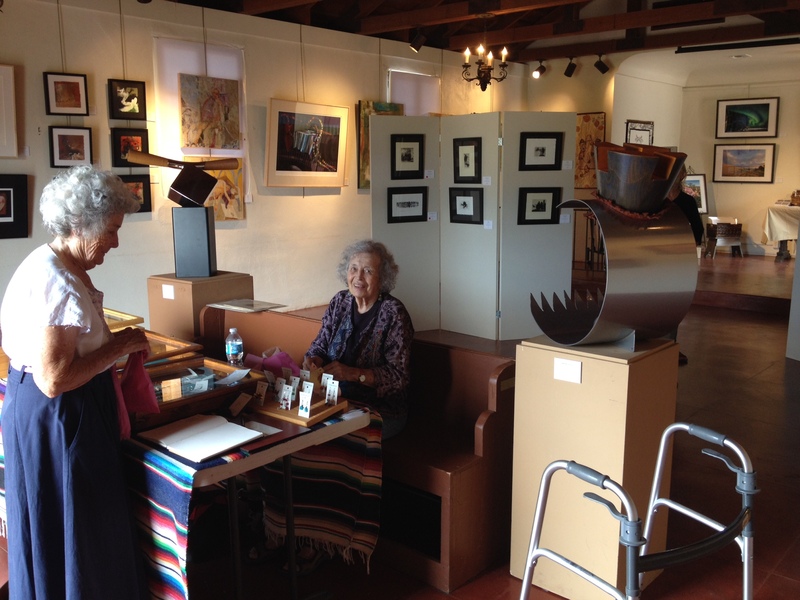 The artists were pleased to have a new outlet for their work, and viewers were introduced to the multifaceted artistic talent resident in the mile square Fort Lowell Historic District. Artwork displayed in the gallery this year included oil, acrylic and mixed media paintings, intaglio prints, darkroom and digital photography, sculpture, weaving, quilting, and hand-crafted jewelry. A lot of hard work went into the two-day show. Michael Bell was the driving force behind the organization. He put the concept out there to attract interested participants, and when the idea took hold he invested a great deal of sweat equity into bringing it to fruition. Every artist represented had a role to play in the preparations, from renting the facility, enlisting the support of the neighborhood, creating a website, generating publicity, laying out the venue, providing music and refreshments, and of course the hard physical work of hanging the artwork. Volunteers from the Neighborhood Association were invaluable assets as they handled the sales and accounting, freeing the artists to interact with the viewing public. The Arizona Daily Star ran a wonderful illustrated feature story about the Neighborhood and its artistic roots which served to attract an even larger crowd. Even the weather cooperated as the threat of Hurricane Odile dwindled and the reception was blessed by a perfect Tucson evening. A round of applause to everyone who contributed to the successful debut of the show! Click on any image below to enter a full screen slideshow. Thanks to Marianne Cracovaner and Linda McKittrick for providing the photographs. The Neighborhood Association organized wine and nibbles for the guests. The reception was crowded with friends, family, and admirers. Ann Hughart Branham (center) with neighborhood volunteers. Carol Bell (left) discusses her husband Michael’s work. Marianne Cracovaner (right) with her oil paintings. Marianne Cracovaner with her painting of the San Pedro Chapel. Ann Hughart Branham (left) greets newcomers. Bob Brisley (on left) and David King (right) compare notes. Carol and Michael Bell did the hard work organized the exhibition. This entry was posted in Art Exhibition, Fort Lowell Historic District, Michael Bell, Patty Hosmer, San Pedro Chapel on October 18, 2014 by Carol.